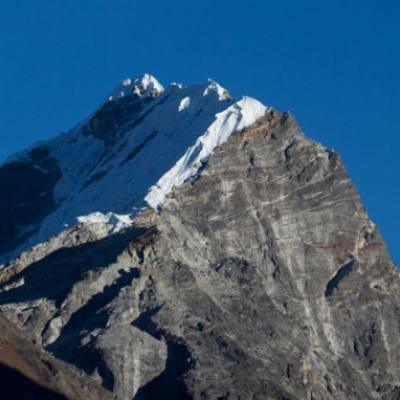 Tent Peak -TharphuChuli Climb an adventure of great excitement which leads you within scenic stunning Annapurna Sanctuary and at Annapurna Base Camp for the climb of striking peaks beyond the sanctuary where trek and climb leads to high technical skill and effort. Although Tent Peak also known as TharphuChuli a lesser trekking peaks below 6,000 m at 5,663 m and 18,575 ft high, but one of the most toughest mountain for challenge to its summit top, the peak with Tent name, as the mountain with rocks and ice resembles like a tent looking towards north east from the Annapurna Sanctuary. 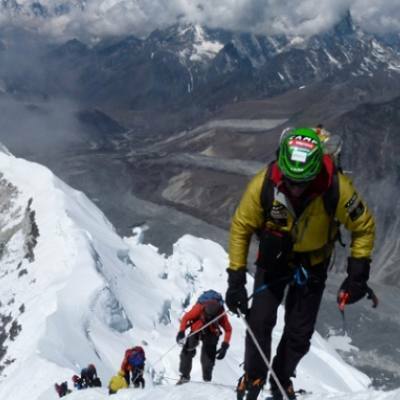 A great adventure which leads you to enjoy with excitement and thrills on the climb to its summit top offers grand views of whole Annapurna range of peaks with other giant peaks of Dhaulagiri and Manaslu in the distance horizon. 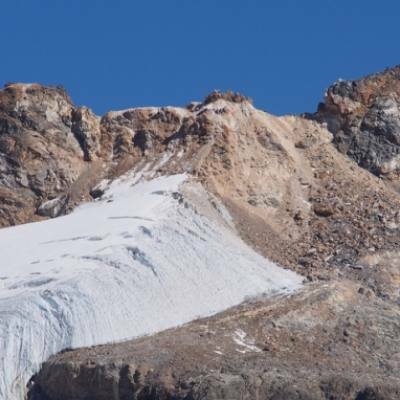 The grade we have set as TD Technical Difficule due to it highly technical effort to cope and encounter on climb where climbers should be well prepared mentally and physically with complete climbing gears for Tent Peak-TharphuChuli climb. 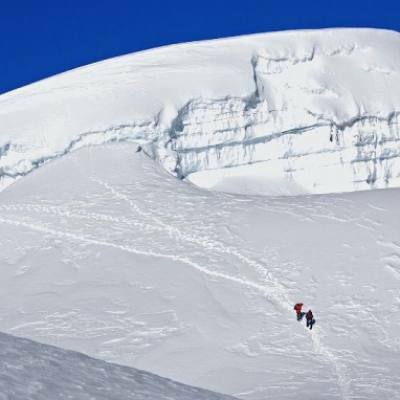 The grade used from famous and popular French and Swiss Alpine Climbing Classification Systems which proves to be the correct grading on this type of alpine climb of a day or more and helps you to prepare beforehand planning this great adventure with us. Starting our journey from scenic Pokhara valley after a drive from Kathmandu and then heading further North West where walk leads to nice traditional villages of Gurung the hill tribe of Annapurna Himalaya interwoven with Buddhism religion. As walk progress entering into Modi River gorge covered within dense green forest of rhododendron, oaks, magnolia, pines and fir tree lines with some bamboo groves and then finally entering into a wide open valley and plateau at Annapurna Sanctuary enclosed within series of peaks all the way to its base camp the last place with facilities of nice and cozy lodge beneath towering wall of Annapurna I. From Annapurna base camp walk leads beyond towards our main highlights heading towards Tent Peak base camp covered with walls of peaks and glaciers, here with time to acclimatize and practice on ice and rocks then getting ready for the big haul on top Tent Peak-TharphuChuli summit following our lead guide, where you will encircled with range of mountains. After a successful ascent on top Tent Peak then heading back to Pokhara taking an alternative scenic route facing views of Annapurna range all the way to reach at Pokhara where our awesome adventure on top Tent Peak-TharphuChuli Climb concludes. 1 Day 1: Arrival in Kathmandu and transfer to hotels.On reaching Kathmandu Tribhuwan International Airport where you will be warmly received by our guide and staff and then transfer you to your respective hotels in the hub of Kathmandu city. First check into your hotel rooms on getting refreshed from the flight and with Jet-Lag, then join with other members of Tent Peak –TharphuChuli Climb for group briefing, where our expert guides will inform regarding your stay in Nepal, hotels, trekking, local lodge and overland drives with do’s and don’ts information, evening welcome group dinner in authentic Nepalese restaurants with Folk cultural programs to entertain you during your meals. 2 Day 2: In Kathmandu with sightseeing tour around world heritage sites.Morning after breakfast leave the hotel for exciting guided sightseeing around Kathmandu where our city guide will lead you to places of interest, Kathmandu a metropolitan city still retains its ancient heritage and varied ancient culture where you will visit world heritage sites around Kathmandu for half day or full day. After an interesting and wonderful tour of ancient historical and religious sites around Kathmandu, with afternoon free preparation for next day journey to Nepal Mid-West for Tent Peak Climb. 4 Day 4: Drive past Bhirethati to Siwai 1,340 m start trek to Jhinu Danda village 1,775 - 04 hrs.After a nice and pleasant stop in Pokhara with excellent views of Annapurna Himalaya with majestic Machapuchare Himal, having breakfast an exciting drive leads you for few hours beyond Pokhara valley to reach our starting point of Annapurna Pun Hill Panorama trekking. Drive leads past Pokhara valley outskirt with marvelous scenery of Annapurna peaks and farm lands and then reaching much warmer areas of Nayapul town by the road side of Pokhara and Beni highway. From here following Modi River to a nice and lovely village at Bhirethati and beyond to reach at Siwai near the side of raging Modi River, where our first day walks begins through farm villages with uphill on stone paved steps to reach at New Bridge and then further up at Jhinu Danda village for overnight stop. A lovely small village full of good lodge and views of peaks and beautiful landscapes where interested people can enjoy its refreshing natural hot spring near the village of half hour walk. 5 Day 5: Trek to Chomrong 1,951m - 04 hrs.Trek from Jhinu a short day today for you to enjoy and immerse into local Gurung culture in the backdrop of Annapurna peaks, morning walk leads uphill for few hours to reach on top of a ridge catching grand views of Annapurna peaks, and then on fairly easy downhill walks all the way to village of Chomrong the last village and the gateway towards Annapurna base camp andscenic sanctuary. 6 Day 6: Trek to Dovan 2,130m via Bamboo 2,050m -06 hrs.From Chomrong our route leads past terraced farmsthen descend to Chomrong River, after crossing a bridge climb all the way for an hour or more to reach at SinuwaDanda and a small village after this scenic spot on winding path into dense woodland with downhill for an hour to reach at a place called Bamboo, a small settlement with lodges in the middle of bamboo, rhododendron and oaks forest. After a brief stop an hour walk on gradual up brings you to overnight halt at Dovan, an isolated spot with fewlodges, located in the midst of a forest nearraging Modi River. 7 Day 7: Trek to Machhapuchare Base Camp 3,720m via Deurali 3,350 m - 6 hrs.After Dovan, walk leads into cool forest with slow and gradual up following ModiRiver upstream, the trail continues with few ups and down to reach at Himalaya Hotel near huge Hinko cave, situated at beneathHiunchuli peak. Himalaya Hotel is a small place with 2-3 lodges. Continue walk withdownhill and then up to Deurali the last tea-house and lodge before Machhapuchare Base Camp. From Deurali where green vegetation and tree lines disappears for short alpine shrubs and bushes, aswalk leads up to follow raging Modi River upstream, the track is quite pleasant with few strenuous climb for an hour in between and then reaching atMachhapuchare Base Camp for overnight stop. Machhapuchare base camp houses about five good lodges located beneath north face of Machhapuchare Himal the Fish Tail peak. 8 Day 8: Trek to Annapurna Base Camp 4,130m- 03 hrs.Today's heading to our main destination and highlight of the adventure as morning with short day walk leads you in the heart of the Sanctuary at Annapurna Base Camp, walk follows uphill for few hours, on grassy path, and then on pleasant path with magnificent view of snow peaks that surrounds you with massive Annapurna I, a great wall of a mountain slowly walk ends at Annapurna Base Camp the one and only place in all Himalaya with nice cozy Lodgesat base camp, offering superb panorama. Afternoon enjoy with views of Annapurna I (8,091m / 26,545ft) Annapurna South (7,219m-23,693ft), Gangapurna (7,455m-24,457ft) and Annapurna III (7,555m-24,787ft), including to Mt. Machhapuchare (Fish-tail) at 6,790 m stretches up towards Tent Peak / TharpuChuli and Fluted Peaks or SinguChuli. 9 Day 9: Trek to Tent peak Base Camp 4,450 m / 14,600 ft - 05 hrs.From ABC our route leads across snow, moraine on rocky path towards icy trail for an hour reaching at Annapurna south glacier. Walk with short climb offers excellent views of Tent peak with other high mountains, after few hours of good trek reaching a flat ground to set our base camp with first night camping, afternoon free for climbing preparation. 10 Day 10: Trek to High Camp 5,200 m / 17,056 ft - 04 hrs.With an extra camp makes the climb to Tent Peak much accessible and with much time to cope the technical route to its summit top , from base camp heading further with steep climb over rock and glacier with lot of boulders, climb continues reaching high camp at 5,200 meters high, afternoon free preparation for next morning final climb. 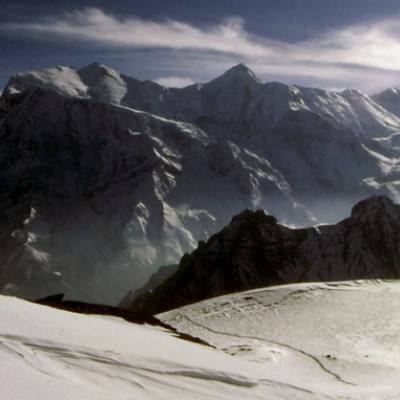 11 Day 11: Climb Tent Peak –TharphuChuliand descend to Base Camp - 06 hrs.Our goal and high lights on this Big Day! Starting early morning climbing over steep snow slope with some technical section to reach on top of the summit; where our expert guide will fix ropes on necessary section of the climb to make it safe to reach the summit, after a tough and hard climb reaching at the top feeling in high spirit with amazing views that surrounds the summit. After a great time on top with awesome scenery descend back safely to base camp. 12 Day 12: Trek back to Annapurna Base Camp - 05 hrs.From Tent Peak base camp after breakfast and cleaning up the base camp walk leads back at Annapurna Base Camp on icy trail, a normal moderate walk of about five hours to overnight stop at Annapurna base camp in the comfort of nice lodge. 13 Day 13: Trek to Bamboo 2,050 m - 06 hrs.After a wonderful time in complete tranquility within giant mountains and in serene wilderness our return journey leads back to lush green vegetation, as walk leads downhill with few ups to reach at Bamboo small settlement for overnight. 14 Day 14: Trek to Jhinu village 1,775 m - 06 hrs.Morning walk leaving behind Modi River and Bamboo areas with short ups and then on winding path into deep woodland to reach at Sinuwadanda with few houses and lodge, from here downhill to Chomrong River with climb to Chomrong village for possible lunch stop. From Chomrong a short climb and then descend on nice paved stone steps to reach at Jhinu village located on a high ridge and hill with super views of rolling hills and peaks, here with time to enjoy its hot natural spring which a short downhill from the village by the bank of Modi River. 15 Day 15: Trek to Tolka 1,640 m via Landruk villages 1,460 m - 05 hrs.Catching views of Annapurna peaks, morning walk leads on pleasant trail into cool shade of woodland with downhill to reach at New Bridge, and then crossing a long suspension bridge with nice moderate walks and then a short climb up to large Landruk village. After a refreshing break carry on trekking where walks gets gentle on winding trail with short uphill to reach at Tolka for overnight stop with views of Annapurna South and Huinchuli peaks. 16 Day 16: Trek to Dhampus 1,530 m (04 hrs) then drive back to Pokhara 860 m - 01 hr.Trek to Dhampus 1,530 m (04 hrs) then drive back to Pokhara 860 m - 01 hr. 17 Day 17: Drive or fly to Kathmandu and then transfer to your hotels.Morning transfer either car-coach or tourist bus (as per the size of the group), for drive back to Kathmandu with scenic views of mountains, green scenery of hills and farm fields within nice villages and towns as drive brings you back at hustle and bustle city life of Kathmandu. On reaching Kathmandu transfer to your respective hotels with time for individual activities and shopping souvenirs. 18 Day 18: Depart for international flight home ward bound or to respective countries.Last day in Nepal after a wonderful adventure and experience on Annapurna Sanctuary with Tent Peak-TharphuChuli Climb as wellgreat service of Explorer Adventure, as per your international flight then transfer to Kathmandu international airport for homeward bound or to your respective destinations. Season: March to June and September to mid-December months March to May wild flowers in bloom with clear morning might get cloudy late afternoon times, October to December clear day for views but can be very cold in the morning and night time above 1,600 m high.